Andrés is a native of Cali, Colombia and started dancing at a very young age and was performing on different genres of dance. He began his ballet training at the Instituto Colombiano de Ballet Clasico Incolballet, where he graduated as professional Classical Ballet Dancer in 2001 and danced as a Principal Dancer at the professional Colombian’s Ballet Company for four years. In 2005 he joined Ballet Gamonet in Miami, Florida as a principal dancer and he was there for four years. 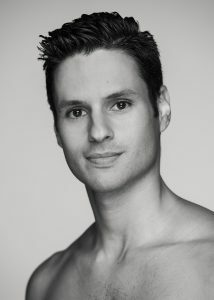 In 2009 Andrés joined Tulsa Ballet under the direction of Marcelo Angelini and was a part of the Company for eight years. Mr. Figueroa has been the recipient of many awards at International festivals including Honorable Mention at the International Ballet Competition Havana (Cuba) 2002; Silver Medalist at Festival Internacional de Ballet (Trujillo Peru) 2003; Semifinalist in The USA International Ballet Competition 2006 in Jackson, Mississippi; and First place (Best Couple) in the World Ballet Competition 2008, Orlando FL. Andrés has danced on stages around the world that includes Spain, Portugal, Italia, Panama, Colombia, Peru, Cuba, Puerto Rico and USA. He has been invited as a special guest artist with Rochester City Ballet (Nutcracker) , The Dallas Metropolitan Ballet (The Night before Christmas), Ballet Concerto of Miami (Diana & Acteon and Don Quixote) Ballet Concerto of Puerto Rico, The South Florida Ballet Theater and with The Cuban Classical Ballet of Miami. Andrés has danced in pieces of internationally renowned choreographers such as George Balanchine, Ben Stevenson, John Cranko, Kenneth MacMillan, Ashley Page, Edwaard Liang, Twyla Tharp, Ma Cong among others. Mr. Figueroa’s repertory includes the Principal and Soloist roles In Coppelia, The Nutcracker, Don Quixote, Diana & Acteon, Tchaikovsky Pas de deux, Le Corsaire, Paquita, Romeo and Juliet & La Bayadere.